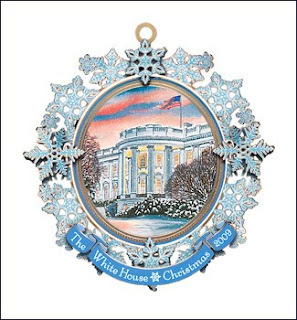 To my good friend Margaret Huddy, as the 2009 Christmas ornament sold by the White House Historical Association incorporates her painting of the White House. She tells me that she's been also selling them in her studio, and that they're going like hot cakes. They are $17.79 with tax and can be picked up at her studio (Studio 203 at the Torpedo Factory, 105 N. Union Street, Alexandria, VA 22314, 703-683-1081). If you live far away and can't make it to her studio, then you can order them directly from the White House Historical Association here. I asked for input on the issue facing the Torpedo Factory and so far have received loads of comments and several key inputs from both artists and critics. One of the first things implemented by the new TFAA board in June was to open the doors. The front doors are automatic sliders, so the board arranged to have the side entrance and the back doors open to the public during business hours. Counts showed that leaving the doors open increased foot traffic into the building by 20%. Several visitors who made it up to my studio on a back hallway on the 3rd floor were grateful the doors were open and said it made them feel welcome. One was a homicide detective from the Bronx. He started the conversation by saying that as a detective he had learned that people don’t go through closed doors unless they are sure what is on the other side. Our signage is old and faded. Things aren’t clearly marked. Visitor’s Guide in hand, even he wouldn’t have come in if the doors hadn’t been open. That one simple change was really working. That did not stop a couple of building artists from complaining about “wasting our air conditioning and raising our energy costs and in turn our rent.” I personally watched one long-term lease-holding artist go back and close them more than once. Someone in the building complained to the City. The City then sent someone over to review the matter and told us we COULD NOT leave the doors open. We increased traffic like the City had wanted and they were the ones who ordered the doors shut. The TFAA board has asked the City for parameters, so that when the weather is reasonable we can leave the doors open but have gotten no response. The board has offered other suggestions to work around the City’s concerns but has so far heard nothing back. The doors aren’t open not for lack of trying. We know most businesses along King St. already do this to draw customers. We know the shuttle boat waiting area, under the Chart House Restaurant, funded by the City blasts air conditioning while leaving the doors open so that people will be drawn in. The TFAA board has offered to paint the back doors and make them more inviting but the City who owns the building said that was their responsibility. They would look into it. The board has checked back with the City on any progress. Still no response on that. Two exciting projects that were designed, approved and funded by the City have been dropped by the them with no explanation. The first, to replace the back doors all together with something more inviting and visitor/traffic friendly. The second, a complete redesign of our back entry area with new lighting, flooring, display and educational information. Why were they dropped after they were funded we haven’t been told. The TFAA board has since taken a grassroots approach, come up with a plan and painted it with the help of artists. Even with the doors to our studios open, I am well aware of the force field you spoke of. Some visitors will stop and literally lean through the doorway but won’t come in unless I invite them. I kind of thought that if they had made it to the 3rd floor they would have figured out that the doors are open for a reason. I have gotten more traffic in my studio since starting to bring my dog to work. I work in fiber and find that people who might not understand or be familiar with fiber work, at least cross the threshold to greet the dog. More common mediums like painting or photography might not have that problem. Once they come in I can turn them into fiber art lovers. The dog is just the loss leader, of sorts. Hey, if it works, my dog is up to the challenge of unstoppable belly rubs to help me bring visitors through my door. As for bringing edgier art into the factory, I’m as guilty of that as anyone here. My installation for Artomatic that got so much press is a departure from the work I show here. I wanted to do it at Artomatic because I thought I could be more creative there. I felt that if produced the piece the way I wanted to, it would never be seen inside these walls. Now, to my total amazement, there is even talk started by one of the oldest members, of bringing it here and displaying it in one of the public areas. I never thought I would see the day where Catharsis & Karma would be in the halls at the Factory. I have lost track of the people who have come in to my studio here specifically to see more of the same and are disappointed I haven’t taken such a risk in my other work. That is all going to change. Most of us in the Factory ARE striving for change. Most of us. We want to be the best art center possible for 2009 and are well aware that we can’t rest on 35 year old laurels. Unfortunately we also have some people here who don’t welcome or want to recognize the impending and necessary changes, some who might want to hide in their studios and ignore the situation because they think the City would never kick us out, or people who, I think would rather the current board fail than the building as a whole succeed. It isn't split along age lines as you might think with the younger members wanting change and the older members resistant. Some of the most active and vocal for change have been here the longest. Our troubles come as much from within as from outside forces. You have already posted statistics supplied by Margaret Huddy of the Factory. It shows the continuous turnover we actually have and the enormous number of artists who have juried in. Even with that it is hard to get new, up and coming artists to either jury or once they get in, to stay because a studio doesn’t guarantee you make a living and most people I know need to make a living. There are rules about how many hours you have to be here and what you can and cannot do. A lot of those rules are from the City. Not everyone can work within those guidelines. If you can, it is a wonderful place to be. A safe refuge where art is made and the public is educated in the process. We know we have a gem that is in serious need of polishing to regain its glow. The new TFAA board has all kinds of new projects in the works to prove to the City how serious we are to save our home. The number of events and activities has increased substantially, there is art in the hallways now, there is live music, projects and events are being co-sponsored with younger, hipper arts organizations and with King St. hotels. But, change doesn’t come without major growing pains. Change won’t come without the cooperation and understanding (that we are first a working art center, not a mall) of the City, who is demanding these changes in the first place. It won’t come without the help of ALL the Torpedo Factory artists to see these changes through successfully. Those who think – either artist or city official - that dragging their feet isn’t going to end up hurting both sides in the end is mistaken. Otherwise I fear the doors, at least for the Torpedo Factory Artist Association will be permanently closed and the City will move a slicker more profitable tourist attraction into the space. The City will lose an important cultural landmark, arts, education and tourist destination and we the artists will lose our studios and the daily joy of getting to share and educate the public about art. Thanks for bringing the situation to light. Light is good. Our problems won't be solved in a vacuum. The Torpedo Factory is too valuable an asset to the greater DC art community to see it die of old age without a fight.